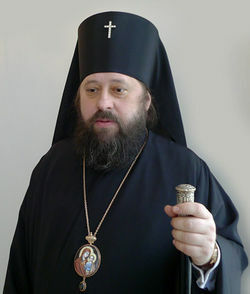 His Eminence Jonathan (Tsvetkov), also Ionafan (Tsvetkov), is the Archbishop of the Diocese of Abakan and Khakassia, under the jurisdiction of the Church of Russia. The diocese is located in the southern part of central Siberia. Igor Vasilyevich Tsvetkov (Игорь Васильевич Цветков) was born on June 8, 1962. He entered the Holy Orders when he was ordained a deacon on February 25, 1986. Dcn. Igor was ordained a priest on March 20, 1988. Fr. Igor was tonsured a monk on December 25, 1989, receiving the name Jonathan. Fr. Jonathan was elected to the episcopate in 1997 and was consecrated Bishop of Yuzho-Sakhalinsk and the Kuriles on August 1, 1997. He was transferred to lead the Diocese of Abakan and Kyzyl as the ruling bishop in 1999. February 1, 2010, he was elevated to the dignity of Archbishop. On October 5, 2011 in connection with creation of the Diocese of Kyzyl his title changed to Archbishop of Abakan and Khakassia. This page was last edited on April 22, 2013, at 09:59.